I am very big on efficiency, including ensuring that our information flow from our library is used as effectively as possible. We were wondering how effective this was and started doing some statistical analysis. Up until recently, we only counted visits to the actual blogs at Blogger and to our news blog on Drupal. The statistics were better for some than for others, but one of our blogs was quite low and it was getting a bit discouraging, when you considered the effort that went into creating both the blog and the regular content that goes into it. So I took another look at the blog content and how it was being used in various locations. Between readers of the actual blogs (counted using Google Analytics), subscribers (using Feedburner) and then reads of the blog posts on our website (counted using Drupal Statistics), we found that our blog content was being read by anything up to 300% more than just at the blogs alone! Quite eye-opening really. And this doesn’t count the people who just scan read the summary of each post as it appears on the library’s homepage. The Drupal only counts a read when the post title is clicked on and the reader goes to the full-text of the posts (which is also on the website). So we have this great content, being utilised in numerous locations and getting a much wider audience, with little effort from library staff, due to the joy of RSS feeds. (gotta love em). Then back in August, Brian Herzog posted on his blog Swiss Army Librarian – Visualising the flow of my library’s information online and I pounced on that idea. His flowchart came after their Facebook page launch and so I created one for our library, to help convince our management that we should launch our Facebook page. Their reasonable concern was that it would be too staff-intensive for too little return. The flowchart was designed to show that staff time would be minimal and after some guidelines on management of the page were created, we got the go ahead to launch. We could have automated the process further, by posting the feed from our library news blog straight to Facebook, but decided against it. Instead, we post that content to our Wall, in a bit more of a casual voice, which gives us the opportunity to engage more personally with our Facebook page and our fans. Can we use this concept for other information flows? I am thinking of doing one for my personal presences, seeing where I can maybe get a more consistent message out on my various networks. But that’s a task for another day. 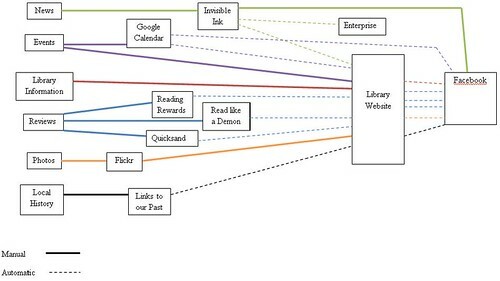 How does your library’s online information flow work? Would love to hear any ideas you have that might help us change or improve ours. This looks great – I hope it helps. And I actually love your idea about doing a personal flowchart too. I will definitely have to do that myself. Thank you, for getting it all started. It has been a very helpful and enlightening process.